Indulging in memories of long ago, like those of my parrot Lorro, impresses me with the bittersweet transience of such moments and beings that now are only immanent images in my aging mind. But I woke up in the wee hours of this morning thinking of a memory that still very much exists in the present. I call it my rock of ages. At least 40 years ago (curious how 40 years seems to create a natural cycle! 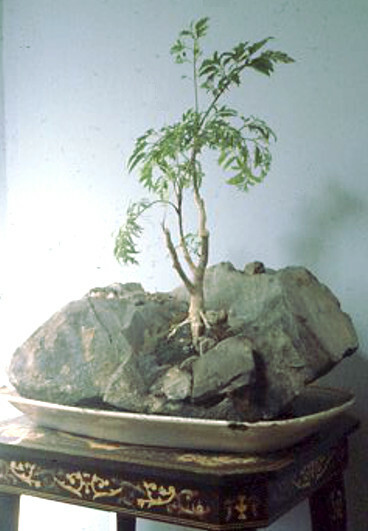 ), I was even then a “plant freak.” After visiting the stupendous bonsai collection at the National Arboretum (a gift to the US from Japan for the Bicentennial), I decided to try my hand at bonsai and determined to create one in a naturalistic setting. One Saturday afternoon while sunbathing with the hedonistic crowd at P Street “Beach”, I explored along the banks of Rock Creek and among the jumbled granite chunks found an ideal rock—more like a boulder weighing maybe 75 lb. Balancing it on my bicycle frame, I walked it home to the Four Belles at Logan Circle, lugged it upstairs to my sky-lit conservatory and made a miniature mountain with a tiny tree growing out of a mossy slope. Aurora the Aralia. Aurora flourished on her mountainside for several years, including a sojourn in the window of a 19th floor apartment in New York. Then in 1981 the mountain came with me to New Mexico, where I had to lodge it with an acquaintance in his greenhouse. I’m mortified that I cannot recall who the fellow was or where it was, but that winter it got hideously cold, and the host forgot to turn on his heaters. Poor Aurora froze to death! 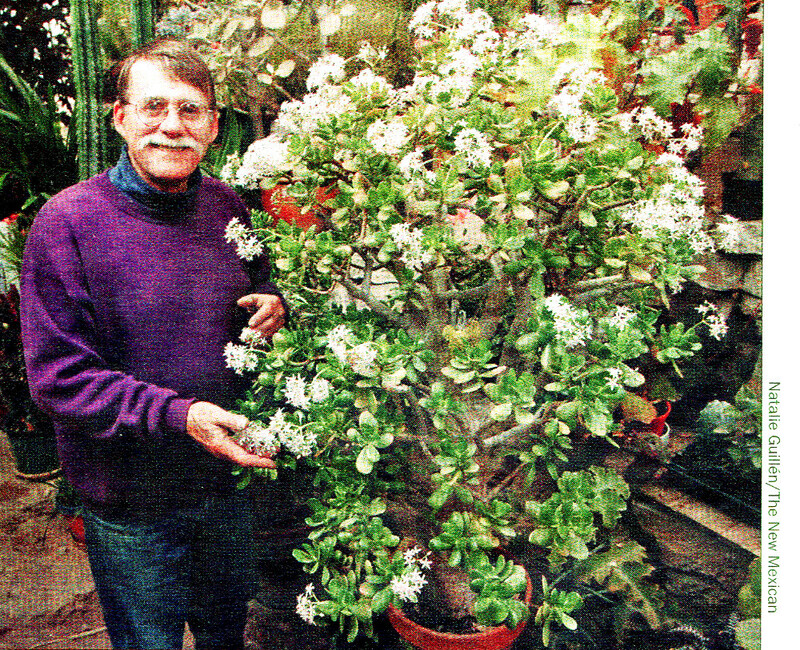 The jade tree I’d also left there froze down to a stub, but it re-sprouted and in 25 years grew into a huge beauty. In my grief, I took the honored rock with me to my new home on West Alameda in Santa Fe and set it out in the “yard”—more like a gravelly field. A couple years later, a sculptor friend (Gretchen Berggren) asked to install one of her works along my terrace wall, a metal-grate “river” with boulders like one she’d done for outside the College of Santa Fe’s Fogelson Library. Seeing my beautiful rock, she wanted to include it in her sculpture, and I was happy to agree. 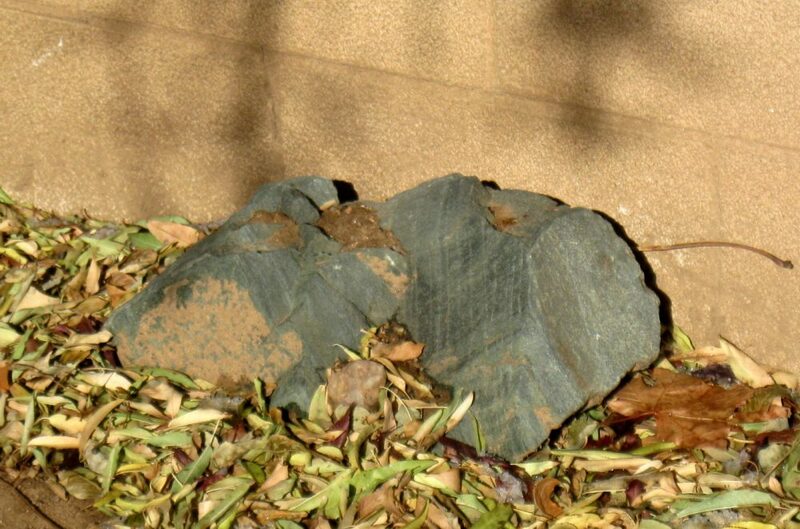 Four years later (1 ½ years ago), when I moved to Alicia Street, my rock of ages came with me and has since sat meditating under my almond tree, probably resting from its botanical, artistic, and architectural labors. I can’t really say if I might set it to another purpose in the future, maybe not, but it will be with me as long as I can lift it. I feel totally blest to have had this special relationship with a mineral entity, or if you will, spirit. When I’m gone, let it remain as my monument.